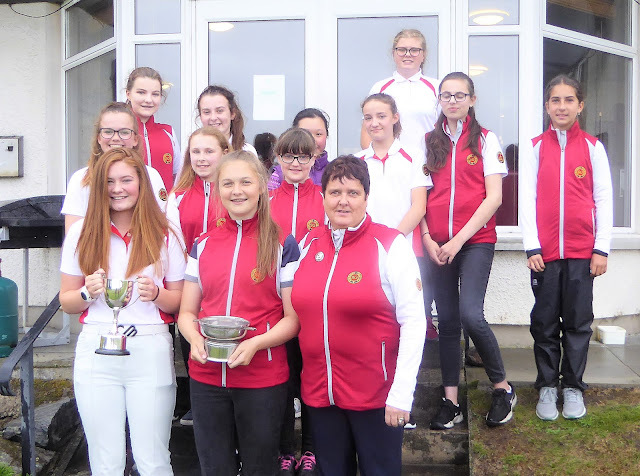 Sarah Westwood (Elgin) won the Northern Counties LGA girls' championship at Tain Golf Club on Sunday. She had a score of 83 - two better than runner-up Mollie O'Brien (Reay). Hannah Riddell (Royal Dornoch) won the handicap title with a net score of 76 off a handicap of 13, one ahead of Katrina Tan (Nairn) who has 14 of a handicap. red tees. Par 73. CSS 73. Prizewinners and other competitors at the Northern Counties girls championship at Tain on Sunday.